Tony Blair needed some good news to ease the crisis over Iraq and his leadership. So it will be a relief to him that the split in Nato has finally been plastered over. But as good news goes it's about as useful as an umbrella in a hurricane. In fact, the prime minister is still surrounded by grimly bad news in relation to his handling of the Iraq crisis. Things have actually got worse for him over the past few days. Thanks to Hans Blix's report to the UN last Friday, those opposed to immediate war have gained strength. The prime minister and President George Bush have been dramatically thrown onto the back foot. Instead of driving ahead to a second UN resolution sanctioning military action, as they clearly hoped they would be doing by now, they have been forced to accept yet another delay. And currently there are no signs whatsoever that France and Germany will be ready to cave in when Dr Blix next reports in two weeks' time, unless he comes up with some pretty damning evidence against Saddam Hussein. Indeed, the only way Nato could reach a face-saving way out of its current crisis was by leaving France out of the loop. And it has left a legacy of bitterness and division. Similarly, the political opposition to the prime minister has hardened over the weekend. That is partly as a result of the Blix report, but also because of the unprecedented anti-war demonstrations around the country on Saturday. Those marches have not changed the prime minister's mind - he still believes the protesters are misguided and just plain wrong. But they have further emboldened those opposing him from his own benches. Lastly, Mr Blair's attempts to seize the moral high ground over Iraq appear to have backfired. By setting out the Iraqi dictator's horrific record of human rights abuses and suggesting the world would be better off without him, he has suggested regime change is now his goal. But it is not. The UN cannot sanction regime change even if it wanted to. And the prime minister has to accept that his only goal is to disarm Saddam. So that raises the obvious question that, should Saddam suddenly fall in line with resolution 1441, he would be allowed to stay in power in Baghdad torturing and murdering to his heart's content. This is not a question the prime minister or his spokesmen want to answer. They talk about Saddam relying for his power on his weapons of mass destruction. The suggestion being if those weapons are removed, he will be out on his ear. But that is very far from certain. Indeed, Saddam Hussein has shown an astonishing ability to hang onto power. So the prime minister's attempts to counter the moral argument put by the anti-war protesters may have landed him with more difficult questions to answer. Meanwhile there are reports suggesting a group of Labour MPs are ready to move against the prime minister at the party conference in the autumn. Of course, things may well look very different by than. It is still virtually certain that there will be military action against Saddam and that, when it comes, opposition will have pretty much evaporated. But then there will be the problem of what comes next - both in Iraq and the other powers identified as the "axis of evil". 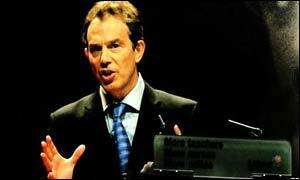 Tony Blair knows he is still engaged in the greatest gamble of his life. And the outcome is far from certain.